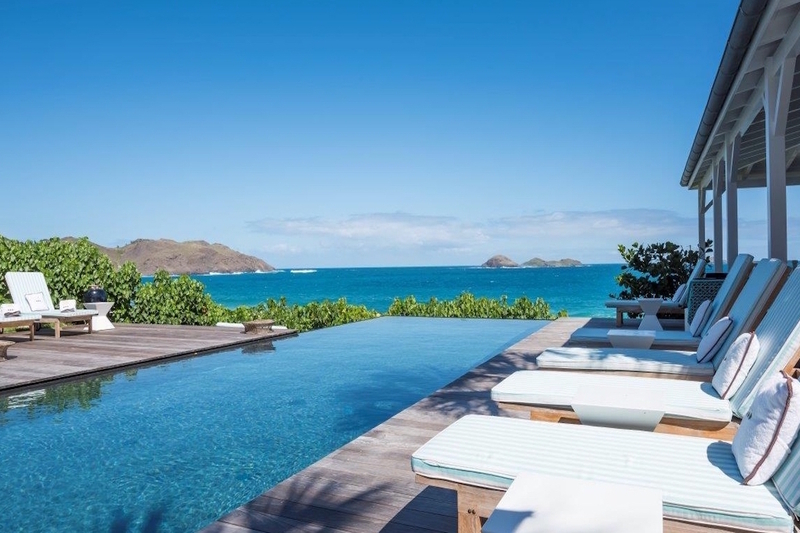 Every room faces the ocean, featuring amazing views of Ile Chevreau, and the St. Barthelemy Natural area. The outdoor sitting areas are beautifully decorated, and there’s even a canopy bed on the deck for afternoon naps! Plus, every bedroom has a mini bar—what’s not to love? Il Faro is a very elegant villa situated on the Anse des Lézards. This oceanfront villa is perfect for a stay with friends or family. The villa’s wide, heated pool faces the ocean with loungers on either side. A small wet bar prevents the need to ever leave the deck. A large Jacuzzi is situated on the master bedroom terrace. The fitness area faces the ocean as well and has a private terrace. The massage room adds luxury to the already lovely home. The living area features multiple seating areas, both inside and outside. The dining table seats 12, and is connected to the kitchen and opens to the pool and ocean. The fully-equipped kitchen sits separate from the main living area and opens to the pool deck. A large island adds cooking space. The first bedroom features a queen bed, ocean view, outside shower, and ensuite bath. The second bedroom features a king bed, ocean view, and ensuite bath. The third and fourth bedrooms feature twin beds, ensuite baths, and ocean views. The final two bedrooms feature queen beds, ensuite baths, and ocean views. The villa also offers a small bedroom connected to the fourth room that is equipped for kids. This roomy villa is ideal for family holidays or traveling with friends. Guests will be met at the airport/car rental area and ushered back to the villa by a local representative from the villa management company.